"It truly is the "missing link"!" Great, I'm so glad I ordered my missing link. From the second I got on it I could feel the difference. It's hard to describe but I would say it's like I added 100 gyroscopes to the frame. I'm going to recommend it to every bike owner I know and I've already expressed my feelings to my local Harley dealer. I have had your rear stabilizer on my 2009 Harley for several years now and love it. I just installed your front lower stabilizer link. Wow! It truly is the "missing link"! My motorcycle has well over 100,000 miles on it. It rides great and your products have made the most cost effective improvements in the way it handles. Thank you True-Track! I just received my True-Track order from you,and am just saying thank you. It was 7 days from order to arrive in QLD, Australia, with good tracking, and parts arrived packed in the best condition, unreal. I haven't fitted yet but am sure if the product is like your service it will be great. And comes with good info and fitting instructions, I'm sure my suspension mechanic will understand. Once again thanking you (from me and my Dyna). "There was not 1 thing on the road that made me shudder or grip and hang on." I hope you had as good of a River Run as I did. Every time I rode my bike after the installation I felt something better and different. I really feel like I have a new and way better bike because of True-Track. The ride home was stress free. It was not work to ride. I must say even with the wind I was not totally worn out when I got home. I did not try any 80 mph turns because there weren't any. But even the wind gusts did not bother me. The bike just wants to drive STRAIGHT. I can ride with NO hands and not try to steer with my legs and body, the bike just goes straight. There was not 1 thing on the road that made me shudder or grip and hang on. This is unreal!!!!!!!!!!!!!! Every thing you said it would do and A LOT more!!!! No Flat tire feeling. No Wobble, just PURE ENJOYMENT for the first time without any worries. I am so glad that I stopped and learned a little about True-Track, and then had you install it. I am so glad to have met Ron and Steve. As I watched you guys work on my bike, you made me feel like you were working on your own bike. That is really a good feeling to have.....THANK YOU!!!! Thank you K-, you really impressed me with your knowledge of True-Track, with your wobble and all!!! I really can't wait to get out and really test it some more on our GREAT riding roads of Arizona. Believe ME you will get a lot of free advertising from me. I am a total BELIEVER!!! I can not THANK you enough!!!! "The new stability is amazing. Your first big on-throttle curve will be worth it alone." Just wanted to drop a line regarding my True-Track experience on my '05 Electra-Glide, which does double-duty as a police bike on our local reserve team. Since installation, I've run almost 1,000 miles, including daily commuting, patrol, parades, practice drills, and a rainy weekend trip through Tail of the Dragon, NC, (382 turns in 11 miles!) from Indianapolis. Originally, I was just hoping to notice the money I'd spent, but I can honestly say the results are dramatic, and worth every penny. I spend a LOT of time doing drills, scraping kickstands, turning 20' (dia.) circles, and beating the life out of my bushings--the new stability is amazing. If you were to install this on your first Harley when new, not to bash, but you'd never know just how good of a product it really is. Hot shots around freeway curves are now eventless--I almost forget I'm on a 900lb bagger. Holding a line riding 2-abreast in a lane is much easier. The bike doesn't "track in a general direction" anymore, but rather "runs a line!" Jumping up and down several curbs--in official duties, of course--has shown that clearance is not an issue, as I was assured by your staff. Obviously, most Harleys are just ridden very straight very far, but for me, whether running down curves or cones, it's like a new bike now. What an oversight to not include this on new bikes. Anyway, again, I just wanted to say how happy I am with the product, and recommend it to anyone on the fence about a purchase. Your first big on-throttle curve will be worth it alone. and letting the bike steer itself - straight ahead - amazing." I just got into my office from having Outpost HD install my True-Track. As per your input, I had them replace the motor mount - it was OK, and check the swing arm by disconnecting the shocks - it was OK too. Then they installed the True-Track for me. The total cost was $210, including the motor mount -- quite frankly it was damn well worth the cost and then some. My ride home - 50 miles of 2 lane blacktop with hills and curves - was the best ride I have ever had on the Ultra. I also ran into headwinds and crosswinds, including a 10 minute downpour - but fortunately no hail. The first part of the ride was in 90 degree heat with lots of tar squiggle repairs on the road. I experienced semi wash and pavement irregularities. All in all a typical ride in CO. I have never experienced such stability with the Ultra. No problems with any of the items mentioned above - and I had always been nervous of all those issues. For example - I have always been in awe of a riding buddy who can cruise at 75 and take his hands off the bars - I have never been able to get up the nerve for that --- until today. I was quite comfortable in letting go of the bars and letting the bike steer itself - straight ahead - amazing. The only things I can't claim are increased horsepower and longer legs. I can't believe I waited so long to install the True-Track and wish I had it on two weeks ago when we rode home across OK with 110 degree heat and 25 MPH crosswinds - I'm sure my ride would have been much more comfortable - or less uncomfortable. My real test came at low speed maneuvers - much improved. I had to stop for gas and lunch and my ability to steer the bike where I wanted it to go was great - never felt so good. I noticed no wiggles when stopping at lights. I just can't say enough. I'm hoping this isn't just first day euphoria and that the good ride continues - which I do expect. However, the real test will come in a few weeks when we ride to Winter Park for the Veterans Rally. I will have my wife and a load on the Tour Pak - that's when the big time wobbles hit on slow speed maneuvers. I will definitely let you know how it turns out. For now, I am just very glad I connected with you and appreciate your advice and assistance in getting the True-Track. I hope Sturgis is a big success for you. I will be in LA in November for a Conference and will try to connect with you. If not, perhaps I'll see you at the 2010 Veterans Rally. For now, I'm not only saying Ride Safe but Ride Stable. Thanks again for your product and your help. I forgot to mention - I had less vibrations - much smoother ride and takes dips and bumps better, too. 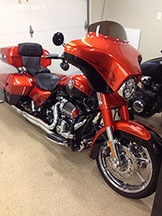 "The bike was fantastic and performed flawlessly thru turns." Just wanted to thank you for your product. I installed the True Track on my 2007 Street Glide last year. I just got back from 1800 miles of turns on a trip to the South. We hit the whole Blue Ridge Parkway and tore up the Tail of the Dragon in NC. The bike was fantastic and performed flawlessly thru turns. Even at highway speeds over 90 mph the bike was fantastic. Quite a noticeable difference. "The True-Track looks like it was factory installed." I am writing to give you my feed back on the True-Track stabilization device that I installed on my 2008 Ultra Classic. I was able to complete installation in about 15 minutes. The fit was very precise and the machine finish is excellent. The True-Track looks like it was factory installed. On the test hop riding two up the handling characteristics are a very big improvement over the stock bike. When riding into a curve the bike stays where I put it, not pushing me to the outside of the curve, it is just like riding on a rail. I am able to ride curves safely and with more stability. My wife said she can feel a big improvement and ride is more comfortable. I am looking forward to pulling my touring trailer knowing the ride will be more stable. All you need to do now is find a way to be able to mount a center stand with the True-Track. Please let me know when you have designed a fit with a center stand. Thank you for making my Harley a safer and more stable handling motorcycle. with bumps the bike never moved, it held it's line." I fit your TRUE-TRACK to my Road which was a straight forward job as I am a wrench. The first thing I noticed was less engine vibration at idle and riding around town, which is a good thing. The real difference was when I took the bike up to 100klm per/hr on tight corners with bumps the bike never moved, it held it's line. I am very satisfied with your product. "I can now cruise at speeds of 80+ like nothing and change lanes like I'm riding on glass!" A few months ago I purchased a new Harley FLH (1st rubber mounted engine bike). Most of the ride home was on the NJ turnpike and if you want to stay with cars and trucks you better be going 70 to 80 mph. I immediately felt the bike wobble and feel very unsteady at 65 to 70 mph and changing lanes was like jumping from a balance beam to a tightrope over a shark filled tank! I have been riding motorcycles for over 30 years and I never experienced anything like that! By the time I got home my arms were completely fatigued. I kinda ignored the whole thing by the next day figuring that its a new bike and maybe it was windy or road conditions etc. A couple of weeks went by and I had put on about 400 miles and the wobble was still there. I brought the bike back to the dealer to check it out for this problem and they said the bike is fine (of course). At this point I surfed the Internet and did not have to look for more than 5 minutes and found out what's going on! I consider myself lucky, most riders I know think that this is normal and have NO idea what a touring bike should handle like. I ordered your product and was shipped to me lightning quick and only took about 20 minutes to install. The transformation was incredible. I can now cruise at speeds of 80+ like nothing and change lanes like I'm riding on glass! Your product should be standard on every FLH that rolls out of the factory. Thanks for a great product and improving the safety of motorcycling for all! "Thanks a lot for a superb product!" Just been out for my first shake down ride after fitting the kit and it seems to do everything you say. It doesn’t ‘white-line’ anymore on road markings and rain grooves. It feels much tighter going round corners and feels like a much smaller bike. Thanks a lot for a superb product! "No more shake, no more wobble, rides smoother and corners better. Riding in a strong cross wind is way way better." I've been meaning to get back to you forever! This is Greg from Omaha. I just wanted to let you know how the True-Track worked out on my 95 dyna wide glide. As my grandma would say, f*ck-an-A, Russell! (I don't know where she got that one). Anyway, it's just incredible! I still can't believe the difference it made. To this day, each time I get on the bike, I think about how well it rides and handles. No more shake, no more wobble, rides smoother and corners better. Riding in a strong cross wind is way way better. The wind blast from a semi blowing by in the opposite direction is no big deal now. It's just amazing! I think before, the bike would actually flex in the middle in a cross wind or a semi going by. Now, it's as solid as a rock. The crappy part of the whole thing is, Harley Davidson knew full well that this was a bad frame design and they did absolutely nothing for their customers to help them! They made this frame for 1 year, 1995. In 1996, they went back to the 1994 frame because of so many problems with the new 95 frame design. Gee, does that tell you anything? At any rate, enough slamming Harley. I just want to say thanks for putting out such a great product! It was worth every penny! First thing I want to say is thank you for making my super glide a super ride! I had zippers performance do a muscle 124"kit. Back cut the transmission gears convert the bike to chain vtc semi lockup clutch this bike cranks, BUT,always was unpredictable in the handling dept. I put new motor mounts in as u suggested. I then installed the 20-30 True-Track for the Dyna. WOW the bike hooks up like crazy. DOES NOT like I call it WARBLE in corners when im enjoying the 135 ponies that the bike makes. At triple digit speeds its rock steady. An added bonus that I didnt expect grooves and uneven pavement only slightly affect the line of travel. OH one more thing I like to ride hoist the front wheel. Well with True-Track installed it doesn't yank up but pulls up much more linear. And one more bonus the rear exhaust pipe doesn't knock off my battery box cover thanks to the travel limiter on the front link. First I want to say, what a great product! 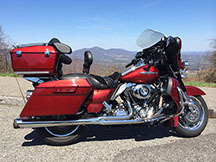 I recently purchased a Harley Street Glide and was, to say the least, was very disappointed with its handling. Being an avid road racer, I have become accustom to high-end suspension and expect every motorcycle to handle like a Superbike (I'm spoiled). Well, I upgraded the front suspension on my Street glide and made several other geometry adjustments in an attempt to eliminate the weave, wobble, running wide, harshness, mushy, feeling associated with the short comings of a Harley. After doing what I could, and felt it was a lost cause, I came across True track! Damn! What a difference! The bike actually handles well and doesn't feel like a lazyboy with steel caster wheels. No more running wide! And it goes where I tell it to. Thanks! "Product is made well. Instructions are clear and she does exactly what is offered." Just wanted to tell you, I installed your product on my 2002 Ultra and what a difference. I read numerous articles and various opinions about your product. Glad I bought one. I noticed the slight float I had in the fairing is gone. I tried out a good road we have that has lots of sweeping curves and she tracked great. I am a believer. Product is made well. Instructions are clear and she does exactly what is offered. "I'm pushing 192 horsepower and 121 ft-lb torque and under hard acceleration and decel it rides perfectly straight and feels very solid, even when the wheel is slipping." I want to thank all of you for taking your time and knowledge to develop a True-Track for the V-Rod. I'm pushing 192 horsepower and 121 ft-lb torque and under hard acceleration and decel it rides perfectly straight and feels very solid, even when the wheel is slipping. 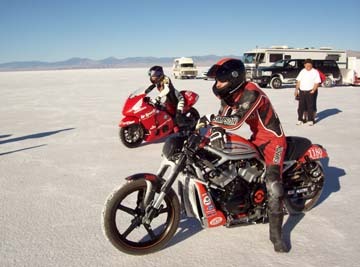 As you probably heard the traction at Bonneville is far from easy and its presents a lot of challenges. I definitely had a big advantage this year and I'm pleased to report I broke 2 world records with a top speed of 179.278mph! Here are some photos. "This has totally transformed the machine." Hi, Just had to tell you that this device is fabulous !! Fitted it in 15 minutes, getting the bubble wrap off was the hardest bit. I live in England where there is a bend every 300 yards. I have a 2007 electra glide which ridden enthusiastically felt as if it was bending in the middle. It followed ruts and although it never got out of control the rider effort was much higher than other bikes I have owned. Well not any more, rock solid, ignores ruts, corners as steady as a rock. This has totally transformed the machine. I always wanted and loved this bike but now the reality matches the dream. Off to Europe in June and thoroughly looking forward to it. Bring on those twistys !!! Thanks again this is the best purchase for a motorcycle I have ever made and I am 52 and have owned bikes forever. Oh and in case you can't guess, I'm pleased !!! "To say I'm impressed is an understatement!" I ordered my True Track for my '07 FLHX on a Friday afternoon, expected it the following week, maybe Thursday. Very surprised when it showed up Monday morning. Well, right to the garage to install. As easy or easier than promised. Took me longer to get all the tools and something to lay on than install. Got my first ride with it on Friday, a trip to Chicago and back, a little over 350 miles round trip. To say I'm impressed is an understatement! No wobble, no being pushed over when I passed a truck, no wobble when I went over cracks, joints, or those tar snakes, they spray to fill the cracks. I also gave it the no hands test. I can usually only go about a 1/4 to 1/2 mile no handed. With the True Track I went about 3 miles before I had to put my hands back on the bars because the road curved, (don't try this at home, lol). I think every FL should have a True Track. Thanks for making a products that does everything, and more, you said it would. I have called all my friends who have FL's and told them to not only go to your site and look at them, but that they should be the next thing they buy for their bikes. 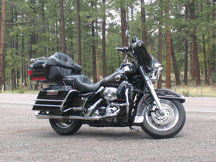 2003 Electra Glide Ultra Classic M Mi young kids thru the canyons. True Track, Harley Davidson should be MMMMMMMMMMMMMMMMMMMM kissing your butts, and thank you for bringing back the fun in riding.